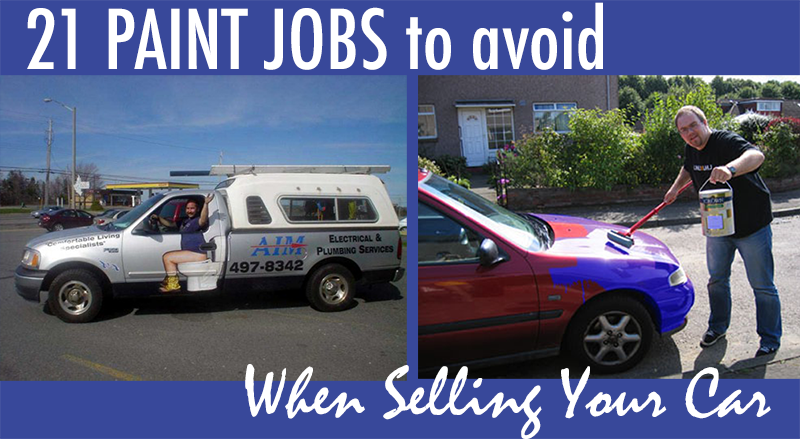 Whenever you plan on selling your car, make sure you clean it inside out. If you don't have the ability to clean it yourself (maybe you live in California where there is a draught), go ahead and take it to a car wash and get it detailed. 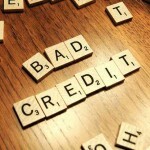 Another good tip... avoid bad paint jobs. You will see in this post just how bad they can actually be. People love their cars. They love to modify them. Some add new rims... some add spoilers... and some decide to paint. It really is amazing what some people will do. The average person usually won't even think about changing the color of their vehicle. If they want bold colors, they will choose bright blue or yellow. Others like to get a little more creative as you will see below. This is probably why car manufacturers decide on car colors, because if you left these choices to some people - we would be in trouble. What makes some people decide to take it this far? Are they bored? Do they like the attention? Who knows! But thanks to them, we get to enjoy these crazy custom paint jobs. Some will make you laugh, others will make you cry when you see what they do to their very expensive vehicles. 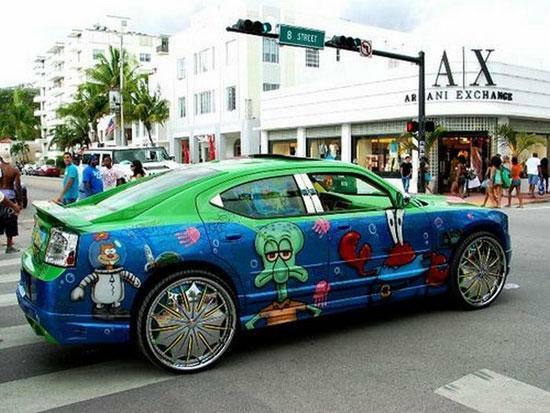 Below is a gallery of some of our favorite bad paint jobs on vehicles. Enjoy! 1) I REALLY HAVE TO GO! Toilet painted on the side of a plumbing truck. Lets hope the driver inside really isn't using the toilet. A toilet painted on the side of the truck may let you bypass a lot of traffic, because when nature calls... it calls. 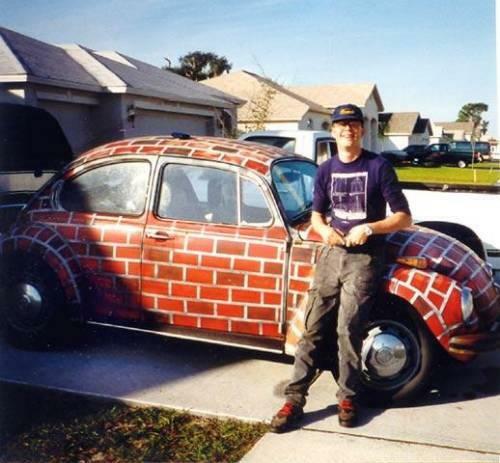 Bricks painted on a volkswagon bug. Seems the driver was deciding between straw, wood and brick. Lets hope this brick paint job will make this car more sturdy. Melted look paint job on a wrecked vehicle. If you get in a car accident, why not keep the car and create a piece of art on the sidewalk?! The melted effect paint job is a nice touch, but the amount of time painting this might have been better spent actually fixing the car. Sea creatures painted and stuck on a vintage VW bug. Looks like the owner loves fish tanks so much, they had to bring it wherever they drove. Pink anime drawn on a sports car. So if you want to sell your car to a man, you've just narrowed your target market. Pink designs painted on a bugatti. Here's another pink car. Except this is pink on a very expensive Bugatti. That's not exactly how to take care of a luxury car. Teenage Mutant Ninja Turles painted on a dodge. 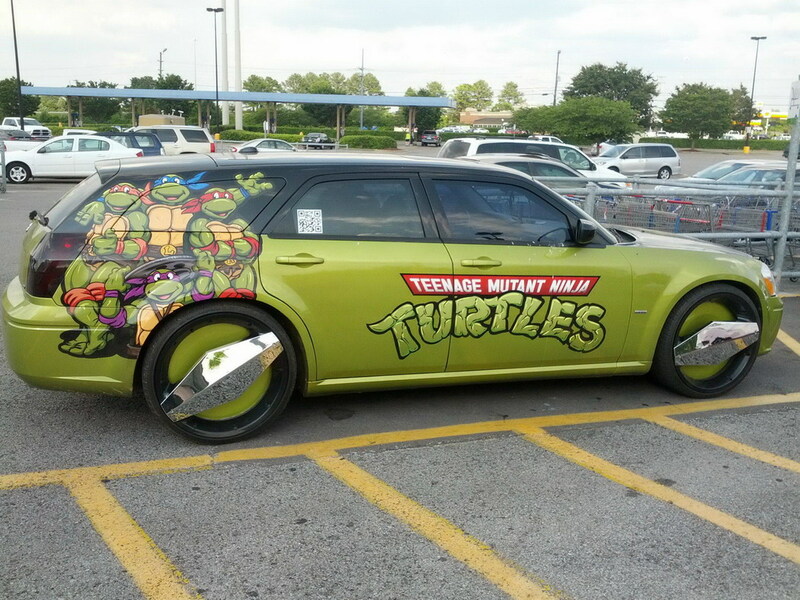 Don't get me wrong, I love the Turtles, but there are other ways to show your enthusiasm for these turtles, and painting your car this way isn't one of them! Cowabunga dude! Lamborghini painted on a van. This van has identity issues. 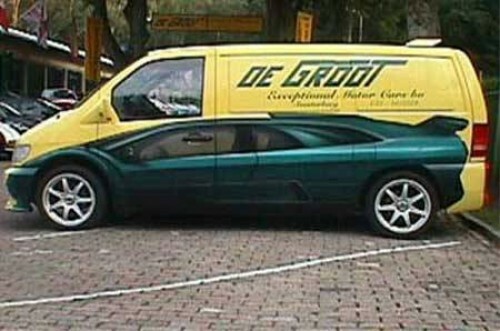 Is it a van or is it a luxurious sports car. The good news is that painting this car was probably a lot cheaper than buying a brand new lamborghini. 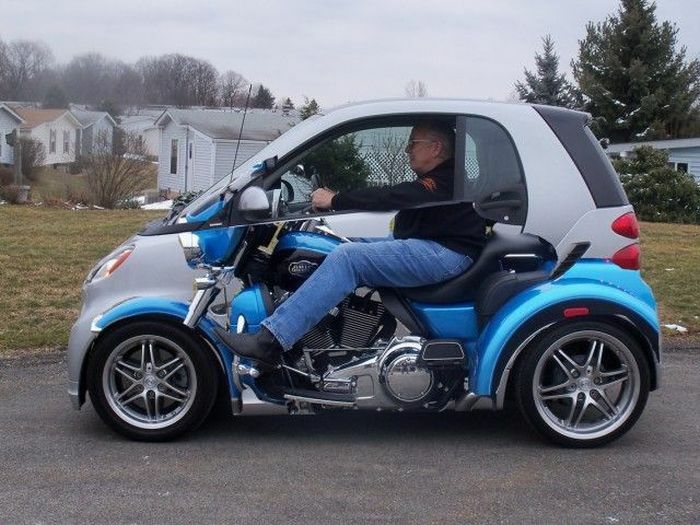 Motorcycle painted on a smart car. Smart cars may not be the coolest vehicle in town. But a motorcycle is - so why not just paint one on your car? Bikini top painted on the hood of a mini-cooper. Planning a family trip to Disneyland in this car may be difficult. There is nothing "mini" about this mini cooper either. Check out those headlights. Chanel logo painted on a car. Does this Chanel car have matching Chanel purse? 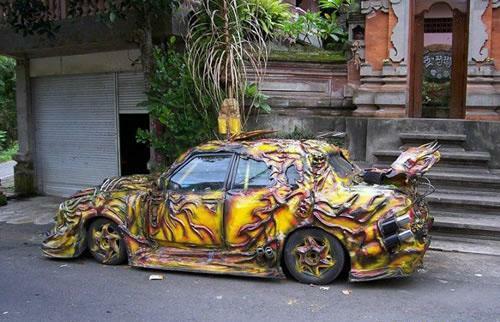 If you can't get enough of how extreme people take their paint jobs, don't worry... because we have more. 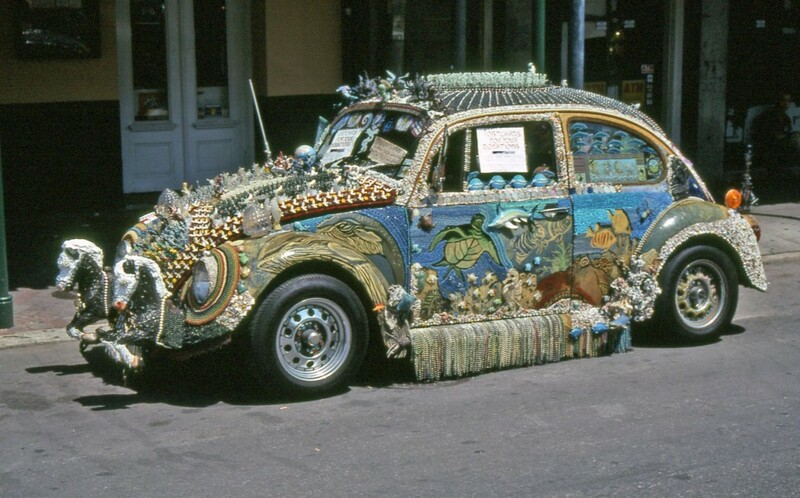 Lets continue looking at some crazy paint jobs. 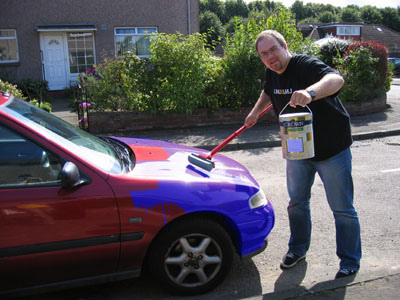 Remember, if for some reason you have to paint your car, try and avoid the below ideas! Enjoy the remaining gallery of paint jobs. 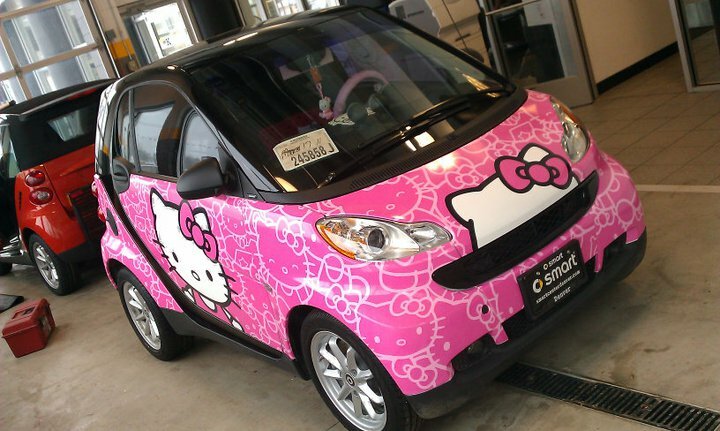 Hello Kitty all over a a little smart car. I get the Hello Kitty craze, but maybe this is taking it a bit too far? Sponge Bob characters all over car. I wonder if this car can submerge under water? 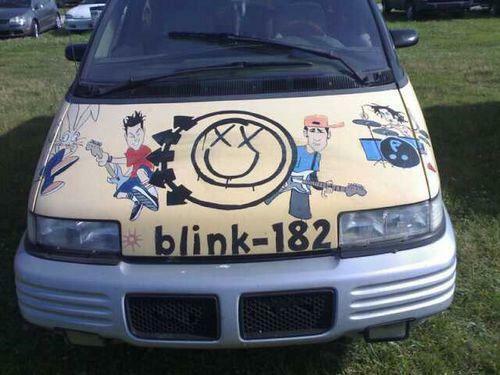 Blink 182 music group painted on the hood of this car. Lets hope the speakers in this car are a lot better than the paint job. A man painting his car with a sharpie. I know Sharpies are permanent, but how many of these markers is it going to take to paint this whole car. By the way, you missed a line! 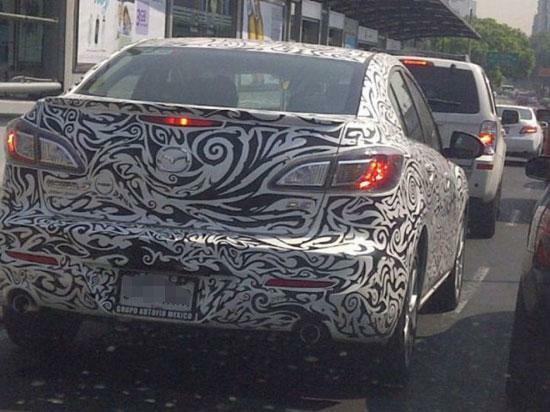 Car covered in tribal designs. How much do you want to bet that the driver has a tribal tattoo on their arm or calf muscle? Guy using a bucket of paint and rolling it onto his car. It probably sounded like a great deal when he could paint his house and his car with the same bucket. 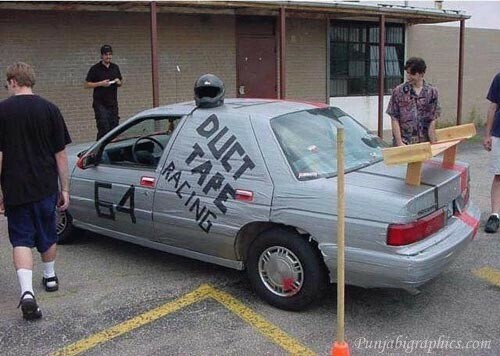 Racing car (sort of) covered in duct tape. I know duct tape holds everything together, but this may be a little too much even for this car. Car covered in Louis Vutton logos. I wonder if the owner of this car had to pay more for his car because of the brand? 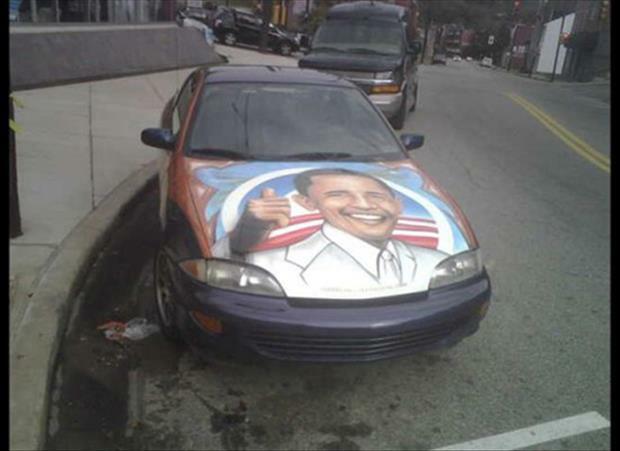 Car with president Obama painted on the hood. We all know who this owner voted for. Guy painted on side of vehicle. 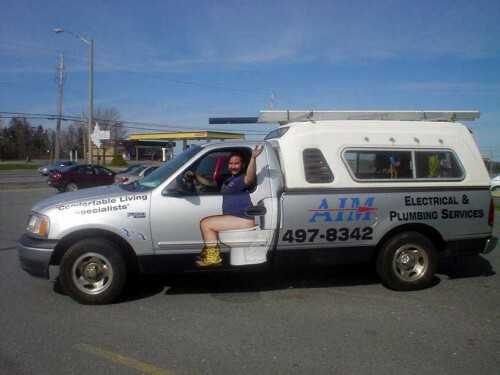 Another clever paint job, but what happens if he sells the car to a woman?